This is a low resolution digital photograph of a large format pencil drawing. It is a view of a group of climbers walking across the headfall of the Scimitar Glacier on the descent from the Mt. Waddington / Combatant Col. 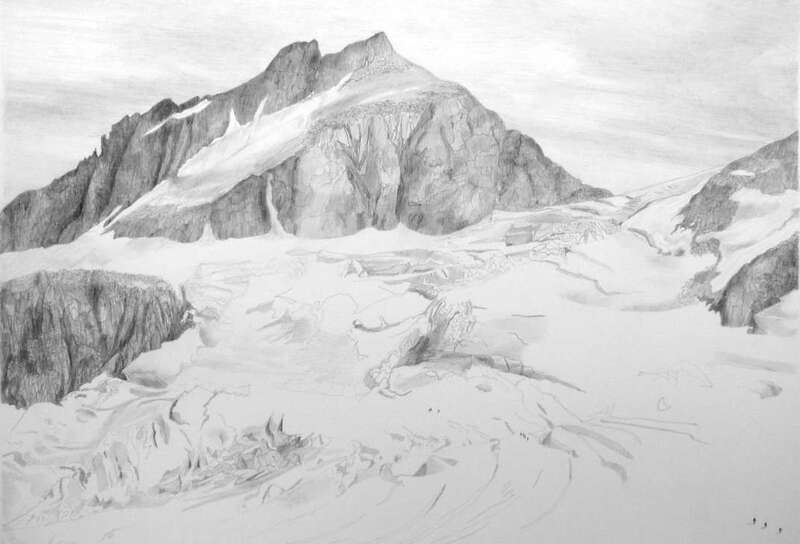 The Scimitar icefall, at the left side of the drawing, falls almost vertically for over 3,000 feet high to the Scimitar Glacier below. This image is composited from some 35mm photographs that I took during the climb, sitting at the top of a 400 foot high ice cliff waiting my turn to rappel down to join the climbers below. We climbed across the saddle in the middle of the icefall and then down to the Scimitar Glacier. The drawing is archivally matted in Crescent 1607 4-ply matte, in an OPUS metal exhibition frame. The image is drawn in HB pencil on a 22" by 30" sheet of BFK Rives 235gsm paper from France.